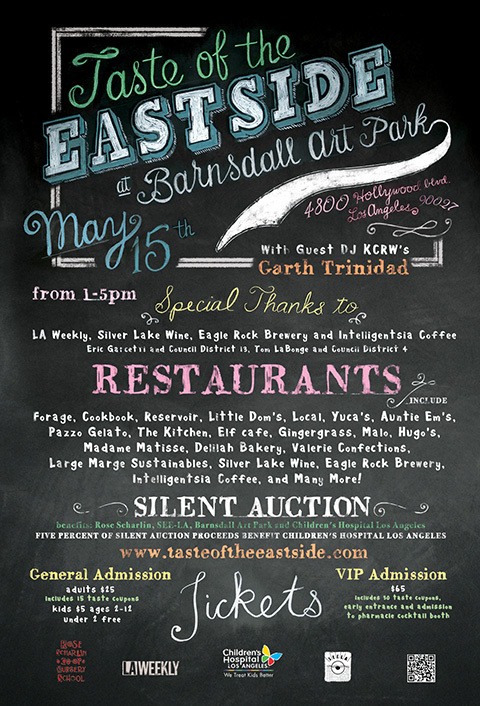 On Sunday, May 15th, the scenic hilltop garden of Barnsdall Art Park will be the site for Taste of the Eastside, an afternoon of food, drinks and music that showcases and celebrates the neighborhoods of Silver Lake, Los Feliz, Echo Park, Atwater Village, Eagle Rock, and Highland Park. Proceeds from this inaugural community event will benefit a number of local charities: SEE-LA, Rose Scharlin Cooperative Nursery School, Children’s Hospital of Los Angeles, and Barnsdall Art Park. At Taste of the Eastside, guests can sample tasting-size portions of signature dishes from a variety of participating restaurants, including Auntie Em’s Kitchen, Gingergrass, The Kitchen, Little Dom’s, Yuca’s and more. Fuel will be provided by Intelligentsia Coffee, while samples of the adult beverage kind include beer, wine and tequila from Eagle Rock Brewery, Silverlake Wine and Malo, respectively. General Admission tickets are $25, which includes 15 Taste Coupons. General Admission entry begins at 1pm. 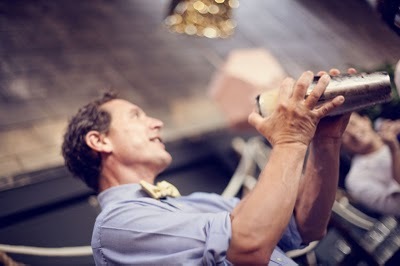 $65 VIP ticket entry begins at 12 noon, and includes 30 Taste Coupons as well as admission into the Pharmacie Cocktail Tasting with mixologist Talmadge Lowe of Heirloom LA. Additional Taste Coupons can be purchased at the event. Besides the food and drink, Taste of the Eastside (in partnership with Skylight Books) is hosting a local author signing event, featuring Randy Clemens (The Sriracha Cookbook), Lina Lecaro (Los Angeles’s Best Dive Bars), and Jimmy Williams and Susan Heeger (From Seed to Skillet). And the whole family can enjoy a free art workshop, presented by Barnsdall Arts Sundays from 2pm to 4pm. KCRW’s Garth Trinidad will provide an afternoon soundtrack of world rhythm and beats. Tickets are on sale now at Brown Paper Tickets. All proceeds benefit SEE-LA, Children’s Hospital of Los Angeles, Rose Scharlin, and Barnsdall Art Park Foundation. 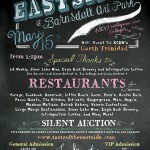 For more information, visit www.tasteoftheeastside.com.